The Philbrook Museum of Art in Tulsa, Oklahoma is an art museum housed in part in a 1920s villa, situated on 23 acres of formal and informal gardens. The original structure is the former home of Oklahoma oil pioneer Waite Phillips and his wife Genevieve (Elliott) Phillips. As of 2007, the museum has a staff of 60 and an operating budget of nearly $6 million. The museum opened October 25, 1939. 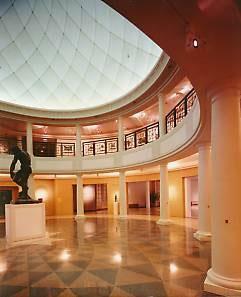 It was known as the Philbrook Art Center until 1987, when the name was changed to Philbrook Museum of Art. The collection housed at the Philbrook Museum of Art includes works from Giovanni Bellini, William-Adolphe Bouguereau, William Merritt Chase, Leonardo Drew, Arturo Herrera, Charles Loloma, Maria Martinez, Thomas Moran, Pablo Picasso, Fritz Scholder, Tanzio da Varallo, Rachel Whiteread, and Andrew Wyeth. A satellite facility, Philbrook Downtown, opened on June 14, 2013 in Tulsa's Brady Arts District. The museum serves an average of 149,000 visitors annually. Front side of the villa. 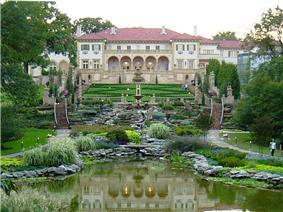 An Italian Renaissance villa, the Philbrook was designed in 1926 by Kansas City architect Edward Buehler Delk. Construction on the mansion was begun the same year by the John Long Company of Kansas City and completed in 1927. Originally called Villa Philbrook, the home featured 72 rooms on 23 acres (93,000 m²) of grounds. The expansive grounds contain elaborate gardens inspired by Villa Lante, an Italian country estate north of Rome designed by Giacomo Barozzi da Vignola in 1566. In 1938, Waite Phillips donated the Villa Philbrook and surrounding gardens to the city of Tulsa, in hopes that the estate would be used for art and cultural purposes. The immense house, with its spacious rooms, wide corridors and great halls, was a natural home for a museum and, due to its steel and concrete framework, minimal remodeling was required to transform the Villa into an art museum. In 1939, Villa Philbrook was opened to the public as The Philbrook Museum of Art and Eugene Kingman was its first director. The museum initiated studio art classes in 1940 and added a Children's Museum in 1949. A new museum wing was built in 1969 in response to an increased demand for studio art classes, but enrollment declined in the 1990s and the use of the space changed. The art museum underwent difficult financial times in the 1980s and a renaissance in the 1990s. The name changed from the Philbrook Art Center to The Philbrook Museum of Art in 1987. In 2009, after a two-year process, Philbrook was reaccredited by the American Alliance of Museums (AAM), one of 286 art museums and 775 museums overall out of the estimated 17,500 museums in the United States. Philbrook has been accredited since 1987. Voices of Oklahoma interview with Elliot "Chope" and Virginia Phillips. First person interview conducted on May 5, 2009 with Elliot "Chope" and Virginia Phillips, son and daughter-in-law of Waite Phillips. Original audio and transcript archived with Voices of Oklahoma oral history project. ^ A Bearded Man, attributed to Giovanni Bellini; tempera on panel: c. 1485. Gift of the Samuel H. Kress Foundation, acc. no. 1961.9.29. ^ White, Kathryn Jenson, "The Jewels in the Towns: Oklahoma's Museums of Fine Arts," Travelok.com (accessed May 6, 2010). ^ "Dine and Shop," Philbrook.org (accessed May 6, 2010). ^ a b Philbrook Museum of Art, Green Country, Oklahoma (accessed May 6, 2010). ^ a b "Gardens," Philbrook.org (accessed May 6, 2010). The museum also offers event spaces. The Williams Conference Center seats 75 to 80 people and the Patti Johnson Wilson Hall, an auditorium performance hall, seats up to 236 people. The museum also offers walking tours of the gardens and a free audio tour of the history of Villa Philbrook. The gardens feature native Oklahoma plants and a refurbished creek. The La Villa Restaurant at Philbrook offers lunch Tuesday through Saturday and also a Sunday brunch. The museum also has a gift shop, The Museum Shop at Philbrook, open Tuesday through Sunday. The restaurant seats up to 100 people. The museum shares the Eugene B. Adkins Collection of Native American painting, pottery and jewelry with the Fred Jones Jr. Museum of Art. The museum's permanent art collection began with a few works of art from the Tulsa Art Association and Villa Philbrook. They grew steadily with gifts of American Indian pottery and basketry from Clark Field beginning in 1942 and the Roberta Campbell Lawson collection in 1947. The American and European collection received a boost from Laura A. Club who donated paintings in 1947 and from Italian Renaissance paintings and sculptures from the Samuel H. Kress Foundation in 1961. Philbrook Museum of Art houses exhibitions from around the world. The permanent collection encompasses European, American, Native American, Modern and ContemporaryArt and Design, African, Asian and Antiquities. The collection includes works from Giovanni Bellini, William-Adolphe Bouguereau, William Merritt Chase, Leonardo Drew, Arturo Herrera, Charles Loloma, Maria Martinez, Thomas Moran, Pablo Picasso, Fritz Scholder, Tanzio da Varallo, Rachel Whiteread, and Andrew Wyeth. 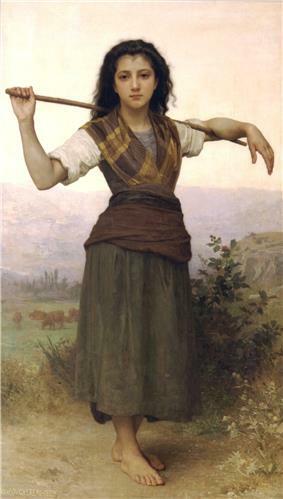 William-Adolphe Bouguereau's painting The Shepherdess is in the collection of the Philbrook Museum.